For the wasabi cream, add crème fraîche, wasabi paste, and some lime juice to a small bowl. Stir to combine. Season with salt and pepper. Refrigerate for approx. 15 min. For the beetroot carpaccio, finely slice beets, using a mandoline. In a small bowl, whisk together rice vinegar, olive oil, and honey. Season vinaigrette with salt and cayenne pepper. Set aside. For the salmon tartare, finely dice salmon filet and shallots. Chop chives. Combine salmon, shallots, chives, some lime juice, and olive oil in a bowl. Season with salt, pepper, and cayenne pepper. Set aside. 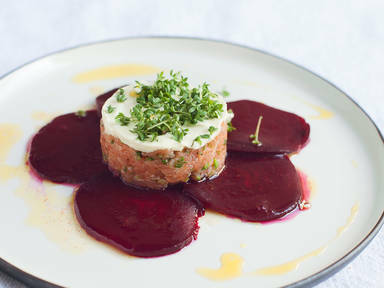 Arrange beetroot slices in a circle on serving plates. Place salmon tartare in the center, using a serving ring, and press down carefully. Spread wasabi cream on top. Carefully remove the serving ring. Garnish with garden cress and drizzle vinaigrette on top.